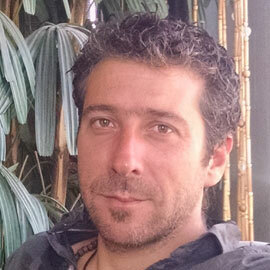 Javier Charme (teacher; co-director, GTT South America) is a Clinical Psychologist with a Transpersonal Orientation, in private practice. He is a Holotropic Breathwork facilitator since 1999. Licensed in Psychology, USTO Chile. Master East-West Psychology, CIIS, USA. He has facilitated thousands of participants in over 350 Holotropic Breathwork sessions around the world. He is Co-Director and teacher for the GTT in South America since 2010. Javier has participated in the training of hundreds of transpersonal therapist and psychologist in several post degrees in South America. For a decade he taught several courses on Transpersonal Psychology and Psychotherapy at Universidad del Pacífico in Chile. He is an international speaker on themes related to Psychology and Transpersonal Psychology. He has organized transpersonal conferences and workshops in Chile, Argentina, Colombia, Peru and Ecuador.